Taic mhòr aig Chelsea anns na h-Eileanan? 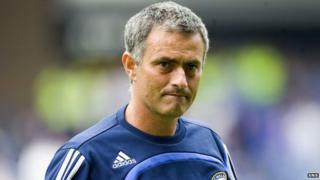 Image caption Tha luchd-leantainn gu leòr aig sgioba Jose Mourinho anns na h-Eileanan an Iar a rèir Twitter. Tha taic a bharrachd aig Chelsea anns na h-Eileanan Iar na tha ann an Taobh Siar Lunnainn, a rèir Twitter. Chuir an làrach meadhanan sòisealta ri chèile mapa a tha a' sealltainn dè an taic a th' aig sgiobaidhean Prìomh Lìog Shasainn air feadh an t-saoghail is e stèidhichte air cà bheil daoine a tha a' leantainn twitter gach cluba a' fuireach. Sheall an sgrùdadh aca gu bheil 14.88% de dhaoine a bha a' tweetadh mun Phrìomh Lìog anns na h-Eileanan a-mach air Chelsea. Bha sin nas àirde na fiù s ann an Taobh Siar Lunnainn fhèin le 13.04%. Tha e coltach gu bheil taic mhòr ann dha sgiobaidhean Mhanchester san Eilean Sgitheanach is Ros is Loch Abar. A rèir Twitter tha 26.9 % de luchd-leantainn Prìomh Lìog Shasainn anns na sgìrean sin a' cur taic United is 15.17% ri City. Tha an dà àireamh nas motha na th' aca ann am meadhan Mhanchester fhèin. Cha robh an taic a th' ann air Twitter dha na sgiobaidhean Albannach na pàirt den sgrùdadh. Chan eil fios a bheil Prìomh Lìog Shasainn a-nise a' meòrachadh air Geama 39 a chluich aig Pàirc Cnoc nan Gobhar.